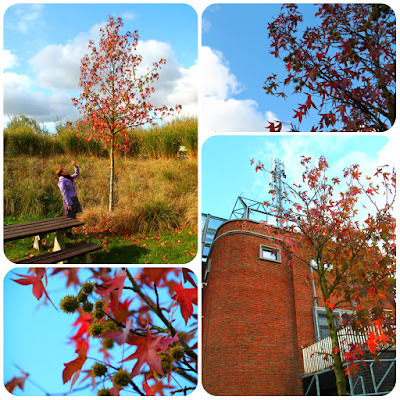 It's November but apart from one or two miserably grey and wet Autumn days, we keep being blessed with unseasonably warm weather. My transitional wardrobe has really come into its own these days, as I've even been wearing those dresses which usually fall by the wayside for it being either too warm or too cold. This pink, tan and taupe short-sleeved dress is made from a lightweight corduroy, its fabric too thick to be counted as a Summer dress, while its short sleeves prevent it from being an Autumn staple. 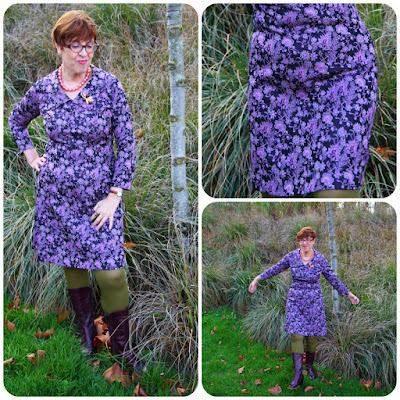 It's been in my wardrobe for well over a year - my blog tells me I bought it in April 2017 - picked up at a consignment store we sometimes visit as a convenient stop-over between charity shops. Their stock mainly consists of furniture of all shapes, sizes and eras, with the odd smaller, usually quite overpriced object thrown in. We treat it more like a curiosity shop, gawping at some of the gorgeous things well beyond our budget and space limitations, while having a good laugh at some of the "what were they thinking of" stuff. At one point, a couple of clothes rails had appeared out of nowhere and, making a beeline for them, I was happy to see they contained lots of vintage. On closer inspection, it dawned on me that I'd seen some of those clothes before, in a vintage shop in Antwerp which sadly stopped trading. It just couldn't be a coincidence, so I'm quite sure that's where they originated from. Over the months, I bought some of the dresses and this was one of them. I wore it for a get together with friends on a Sunday afternoon a couple of weeks ago. Although it had a self fabric tie belt, I thought it looked better with this tan leather belt. I used lilac and purple as accent colours for my plastic peacock brooch, ring, bracelet and cardigan. 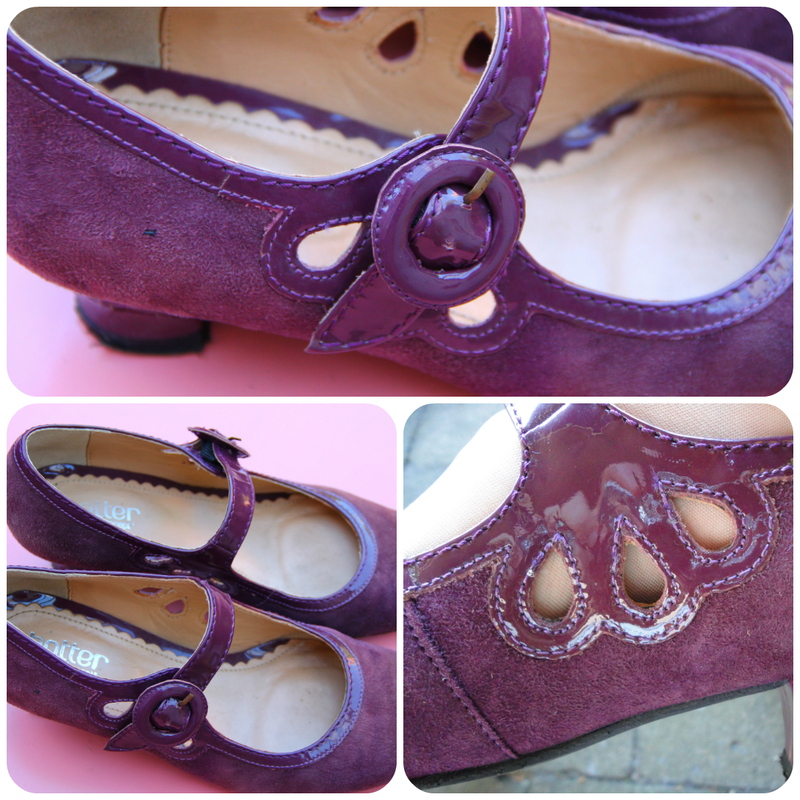 The plum coloured shoes are by Hotter and were a € 2 flea market find back in May. The grey tweed jacket, with elaborate embroidery on its right side, was charity shopped last month, but never shown on the blog. Fast forward to the next week, when on Saturday there was a definite nip in the air, the bright blue sky belying the fact that a cold northeastern wind was blowing, making me regret the wearing of my thin lilac jacket and the omittance of a pair of gloves. With a flea market planned on Sunday, we wanted to take it easy on Saturday, but decided on a short outing to blow away the week's cobwebs. And to show you what I was wearing, of course! Purple, lilac and mustard with a bit of old rose thrown in! 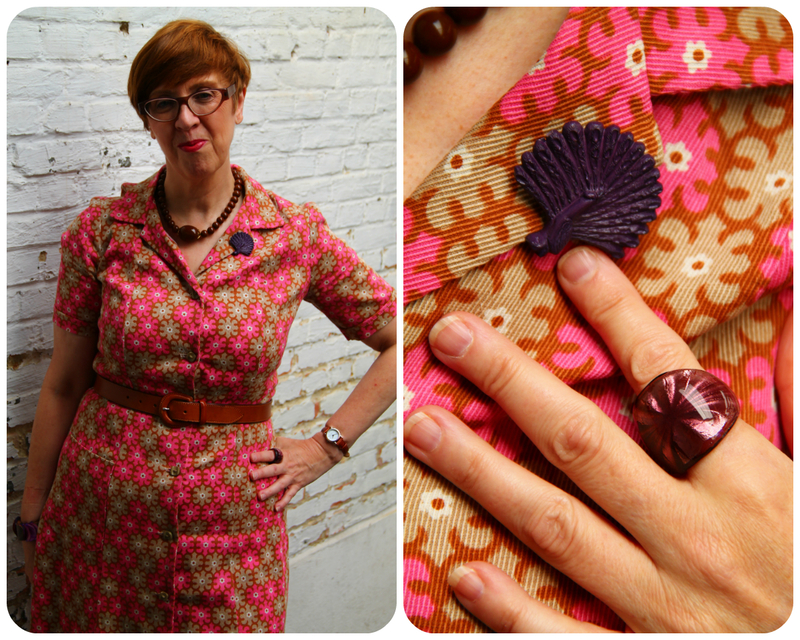 The purple and lilac dress I was wearing, with its dropped collar and three self buttons down the front (purely for decoration, mind you, it closes with a zip at the back) was one of my first ever vintage purchases. I added a mustard cardie and opaques in a similar colour. The first opaques of the season! My burgundy new-to-me boots were a recent find from Think Twice. This really is a case of serendipity as I wasn't even looking. In fact, I'd given up looking altogether for a suitable pair by then. After desperately seeking a fitting pair (and you can take this quite literally! ), I was happy to stumble upon these pull-on ones back in November 2016. However, they weren't easy to pull on. Or off for that matter. Soon, the pulling on had created a bulge on the inner heel, making them quite uncomfortable to walk in. Needless to say that I squeed when I spotted this pair, which not only are a perfect fit, but have a zipper too! We stopped for outfit photos in the little garden behind the old water tower in the neighbouring village of Reet. 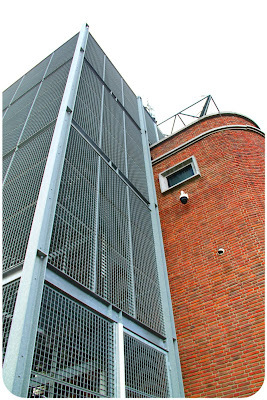 Built in 1938, it was bought by the council in 2008 and turned into a viewpoint in 2012. At first sight, you'd be forgiven in thinking that the low, squat building, merely ten meters in height, is remarkably low for a water tower. 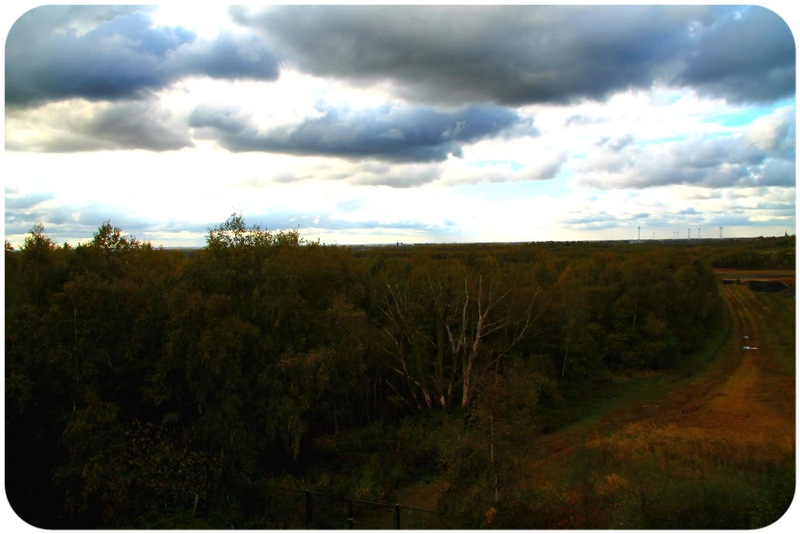 However, as it was built on the highest point of the area's clay formation, forty meters above sea level, this allowed it to fully function as a water tower. 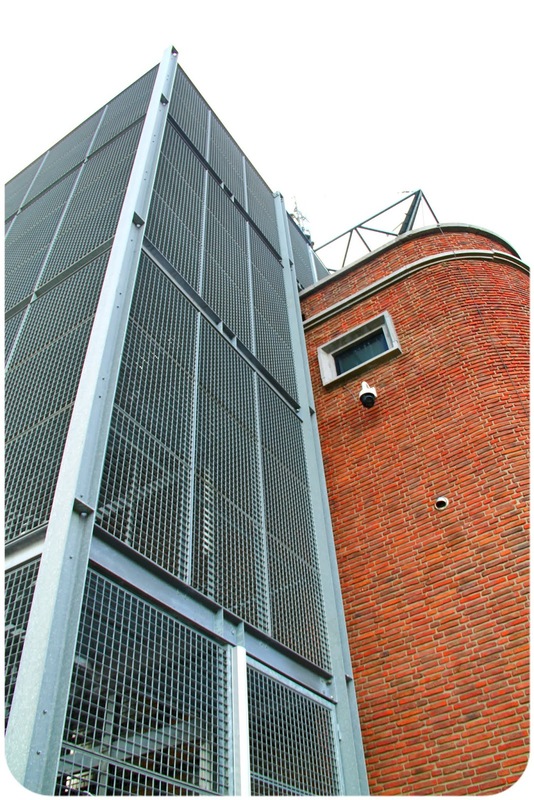 The metal cage attached to the tower contains a set of steps leading up to the viewing platform. We'd been up there once before but after the viewing platform was vandalized in September last year, it had been temporarily closed off. Climbing up to the platform we were rewarded with a panorama of the surrounding landscape, with a working clay pit belonging to the last of the brick making factories in the foreground. They are the lone survivors of the once mighty brick making industry which used to reign the area. 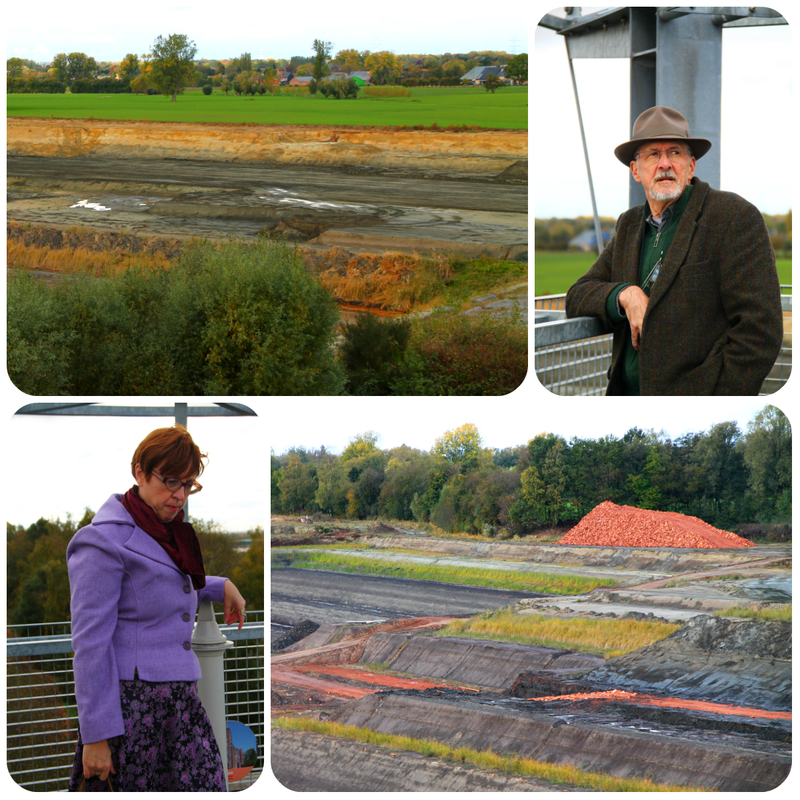 All around, as far as the eye can see, nature has reclaimed the heavily scarred landscape and some of its abandoned clay pits have been turned into precious nature reserves. 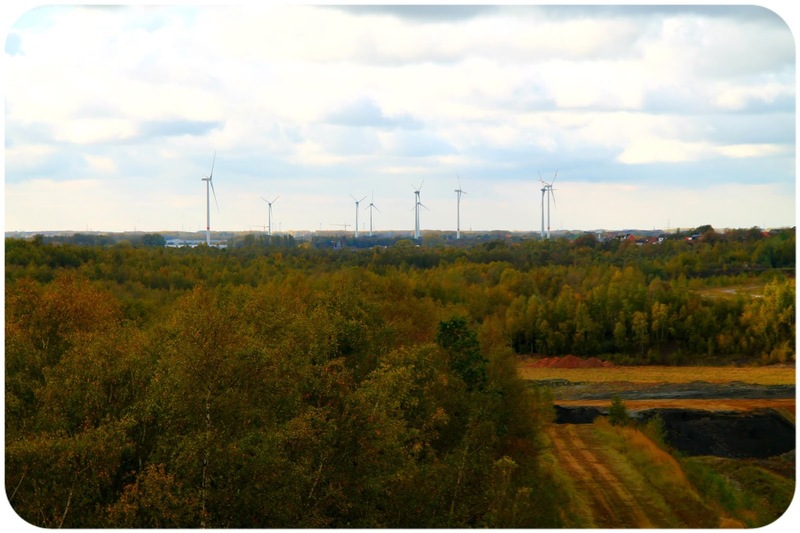 From up here, several local landmarks can be made out, and on a clear day part of the Atomium in Brussels, some 30 kilometers away, can be spotted on the horizon. That day, it was firmly hiding behind some overgrown bushes, so we'll have to return after they have shed their leaves. The sun dived behind an advancing army of dark, menacing clouds, taking away its warmth and leaving the biting wind to chill us to the bone. With a final glance at the bleak landscape suddenly plunged into an eerie semi darkness, we descended the caged stairway back to ground level. I can tell you that, suffering from vertigo, going down those see-through steps was infinitely more scary than going up! ... both of which I would be wearing to the flea market the next day. But that will be for my next post! Meanwhile, I am once again joining the visible ladies at Patti's Visible Monday at Not Dead Yet Style. All the lovely purples are my making my mouth water! I absolutely love your purple dress worn with the mustard cardigan. Fab accessories, too. The first dress was lovely; what an interesting mix of colours it had and I love the embroidered jacket! Where I live in Bedfordshire we too have, or I should say had, brick fields. 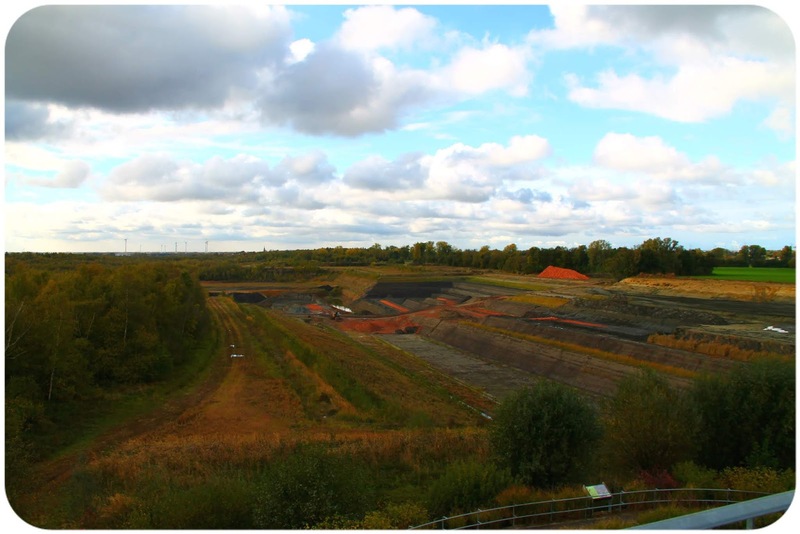 The London Brick Company was based in Stewartby, Bedfordshire for many years (now gone) and one of the areas of Bedford is called Brickhill as it was the site of brick fields centuries ago. That blazer is such a yummy shade of purple! Those new-to-you boots were quite the find as well. I'm enamored with your embroidered blazer in the second outfit. A great match with that dress! It is very sad that vintage sellers cannot make ends meet. Several of my favourite shops closed years ago now. I miss them still. 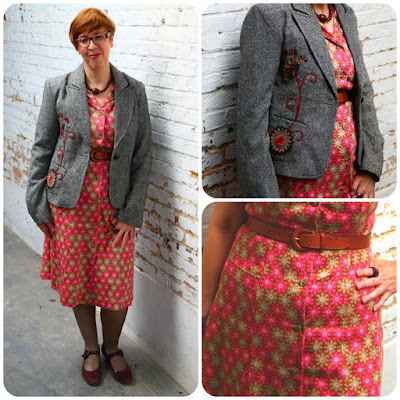 Your embroidered grey jacket is gorgeous and it looks great with the corduroy dress. Then at the end, another great jacket, that berry colour is wonderful. Oh purple-is there anything better than purple boots? Yes, that purple blazer! Seems a shame that the season with the most dramatic colour and landscapes is the least pleasant to be out in. At least by winter we're resigned to heavy coats. Autumn always seems so promising but ends up cold anyway. 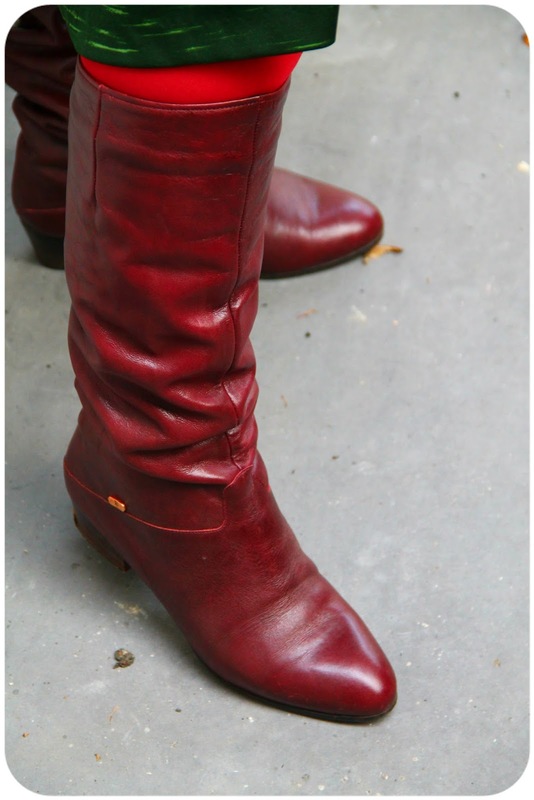 How fabulous you look in violet and I can understand your excitement at finding just the right pair of boots, too. The tweed blazer is perfect with the first dress. I love the silent majesty of wind turbines. I'm loving your transitional dresses, and the amazing color combos you create!. 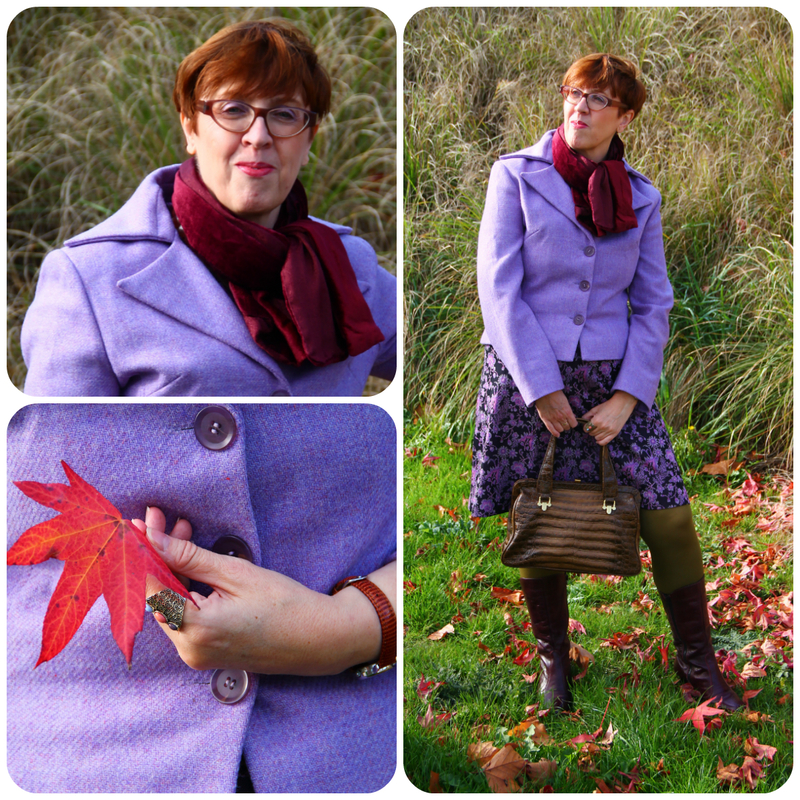 Love the pink dress with the purple cardi and matchy accessories (you rock accessorizing!). 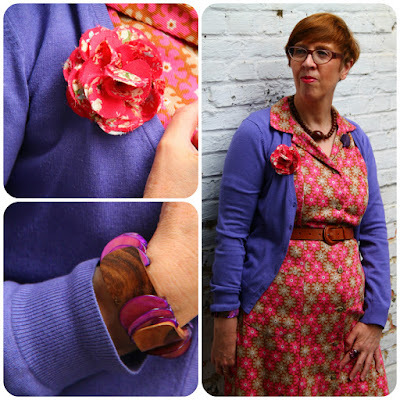 Also love the purple dress with the mustard cardi! 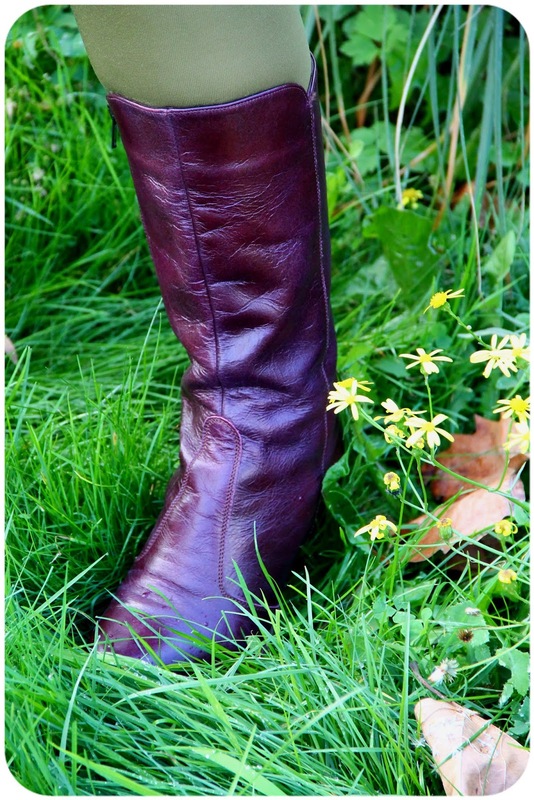 You look particularly fabulous in these purple shades!, and your boots are a fab purchase! 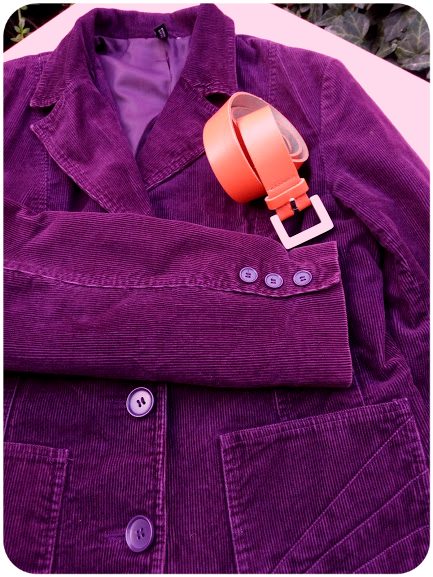 The corduroy blazer has a fabulous color indeed! we too go into some antique shops just for the entertainment ;-D but sometimes finding some affordable things that we like. love all the purple here - soon it will be cold enough to wear my 2 purple suits again! so thanx for the inspirations! So many rich jewel tones. I love the mustards and lilacs and berries. And the boots! And the between-season dress. When I think of towers with lots of steps I often think of Hitchcock movies and Kim Novak. Thanks for these scenes! Fab-u-lous jacket! and I love the purple dress too. You are such a master (mistress?) of colour, Ann! I love all these purples, pinks and contrasting green/mustards in both outfits. Genius! I'm also really grooving on corduroy lately, so am watching for that in the stores. I feel like it's going to have a trend come-back - we are ripe for it, with all this 90s stuff coming back around. As always, I adore all the landscape pictures. It's so beautiful there! Hope you had a wonderful weekend! The transitional dress is super! It's hard when a garment is hard to wear in that way! The water tower is very impressive. Shame that it has been vandalised in the past. 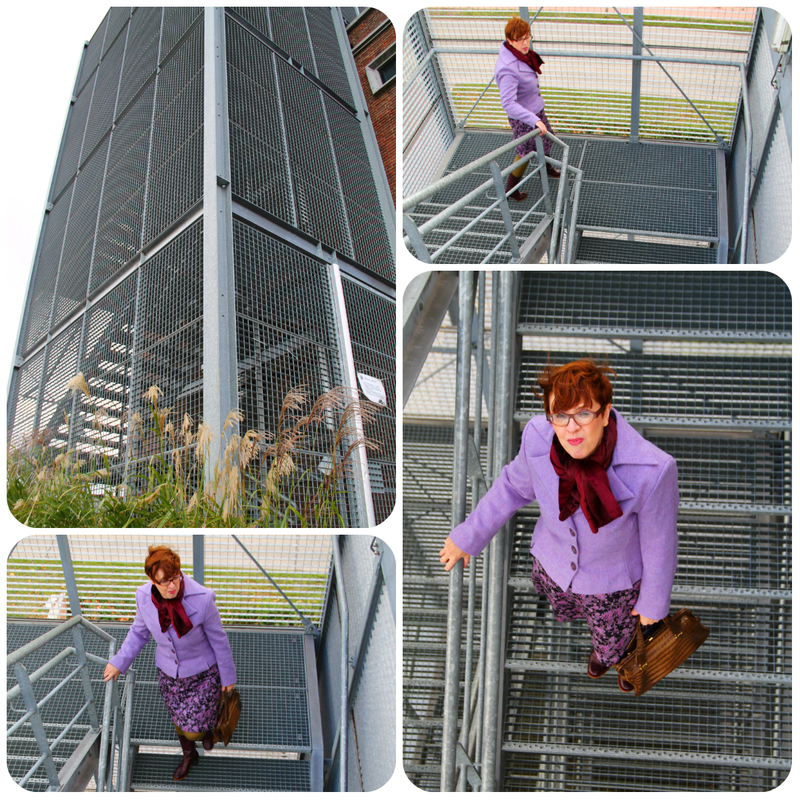 I DO NOT like walking down from a height! It's so scary! I remember being in hysterics when my Mum made me climb to the Golden Gallery and higher at St Paul's Cathedral. I screamed as they tried to make me go further up and refused to move! Autumnal landscapes are so beautiful and dramatic! Must be wonderful to see them from above. Justin and I love antique malls, and Anya and I share the love of Goodwill thrifting. I don't always find something I bring home, but often. :) Though we don't go as frequently, but we still enjoy our trips. You look beautiful in all these shades of purple, from lilac to deep berry tones. And your boot collection is the best!!! I like a bit of corduroy, and that dress is lovely. I had a similar boot finding moment recently. I'd looked all of last year for a pair of black heeled knee high boots and gave up when nothing presented itself. The first shop I walked into on a charity shop rummage recently offered up the perfect pair! I was so pleased!